Gene and Gene Editing is an international journal publishing peer-reviewed research in all fields of gene biology and genetic/genomic technology on the basis of its scientific originality, biomedical importance, and solid conclusions. 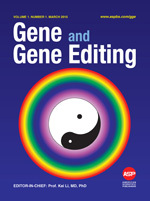 Gene and Gene Editing also publishes reviews in the fields of gene biology and genetic engineering. New strategies, technologies, and therapeutic progress related to human gene therapy are especially the interest of Gene and Gene Editing.